The four Ponteland churches had their prayer mats out again and were rewarded with another dry day for their Annual Party. Dozens of volunteers had put in a lot of preparation and were there early on Sunday to get everything ready to entertain the hundreds who came to sample the very diverse offerings. The familiar displays from the village clubs and organisations, and the sounds of wonderful musical talents were augmented this year by some new exhibitors. The Party organisers from the churches wish to record their huge appreciation of all the local businesses that supported another very successful event. The Punch and Judy show never fails to entertain both adults and children. Try your strength and if you ring the bell you win a balloon. The food options of beef burgers, hot dogs and spicy Indian were very popular. The Friends of Ponteland Park had Lottery Money to fund a variety of displays. Among them was Shaun Hackett who showed children how to sweep for insects in the grass and how many different ones they could find. The Wildlife Trust personnel were giving the young ones a free bird box kit for them to hammer it all together and take away to hang in their garden. 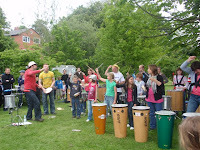 The percussion band of the Ponteland Samba Group, under their leader Chris, played enthusiastically on a variety of instruments.